We love watches! That is the main reason why we keep working on one of the world’s most beautiful minute details day after day. And that is why we serve this little cosmos of timepieces with what we believe to be good functional watches. Yes, we admit: perhaps we have created ochs und junior at least partly because we think that it is possible to do things differently than is usual in the somewhat sedate watch and luxury goods industry. For that reason, we are very happy whenever we find other products that have something to do with time-keeping and are different. One of these products is the QLOCKTWO. It is the opposite of what Ludwig Oechslin develops in his ochs und junior watches. For one, it isn’t mechanical like our watches, but requires electricity. Instead of allowing the time and date to be understood intuitively, the QLOCKTWO displays them as text – they have to be read, literally. The time in words. That’s what this timepiece is about and that’s why this time sculpture draws a smile from anyone seeing it for the first time. 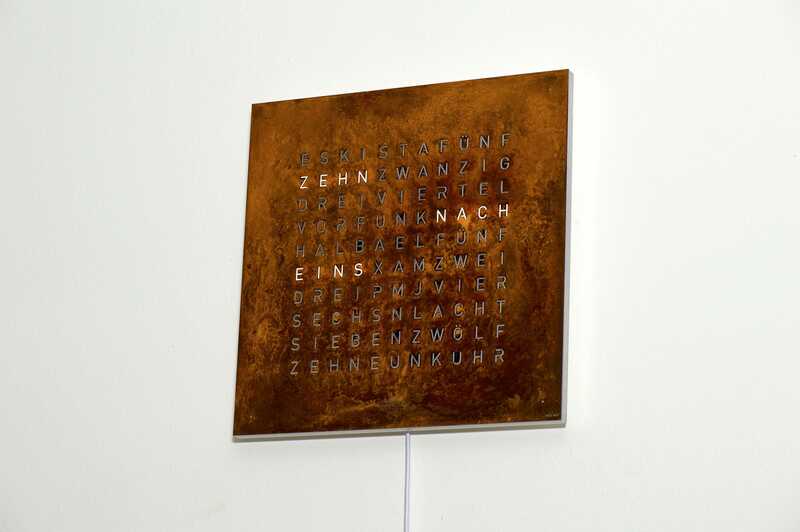 The Creator’s Edition Rust of the QLOCKTWO has been hanging in our workshop in Lucerne since day one. It has become an integral part of our workshop and sales venue, and we delight in it every day anew. There are quite a few who come to us to select an ochs und junior, and who end up buying a QLOCKTWO as well. So far, we’ve delivered versions in standard German, in the Bernese Swiss German dialect, in Dutch, French, Swedish, English, and – particularly spectacular – in Arabic. 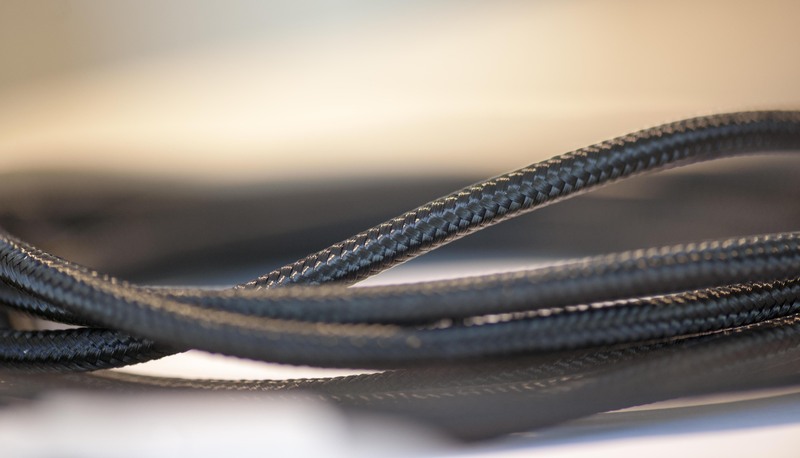 We like the QLOCKTWO best in combination with a textile cable, available in different colors. In the Lucerne area, we offer the possibility of a (simple) wall installation by the company Grüter Elektro. 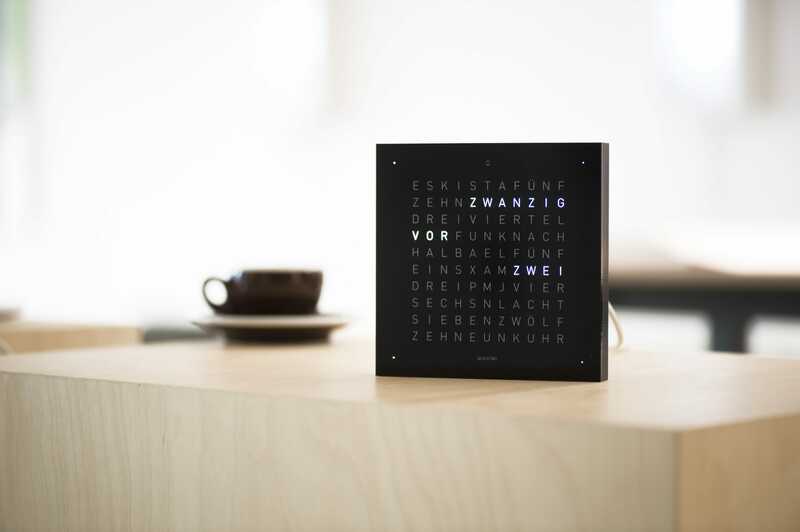 Besides the QLOCKTWO Classic measuring 45 x 45 cm, which is available in different colors and materials in our store in Lucerne, we also carry the smaller QLOCKTWO Touch. This lovingly designed miniature version measures 13.5 x 13.5 cm and makes for a charming alarm clock. 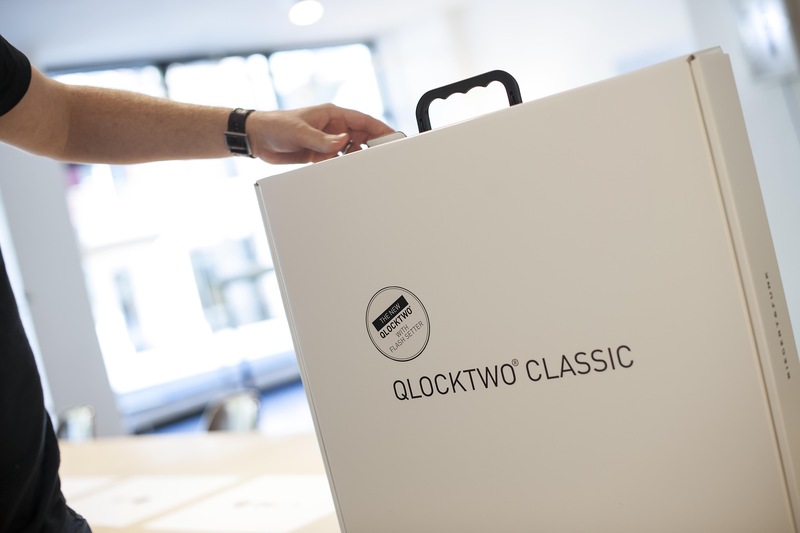 We have numerous versions of the QLOCKTWO Touch and Classic in stock at our workshop in Lucerne. All others can be ordered; they are usually delivered within 1 to 2 days.